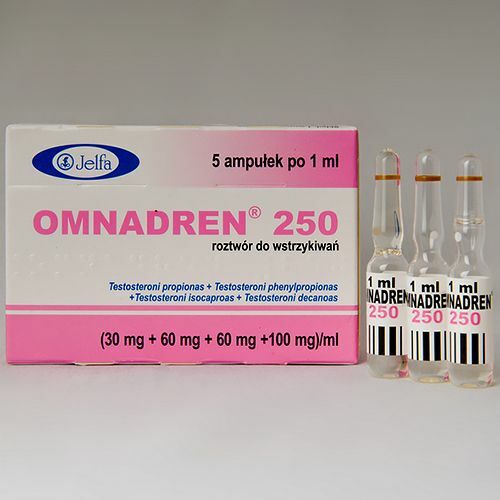 Omnadren (4 testosterones blend) is a strong anabolic with pronounced androgenic activity. It is mainly used as a bulking drug, providing good gains in strength and muscle mass. A rapid increase in body strength and an even increase in body weight occur. Omnadren is designed to provide a fast, extended release of testosterone. It is noted as being slightly more tolerable than cypionate or enanthate. Regularly stacked with just about everything: stacks extremely well with the potent orals Anadrol and Dianabol. On the other hand, Omnadren may work better with trenbolone or Winstrol if the bodybuilder were seeking to maintain a harder, more defined look to his physique. Omnadren will remain active in the body for up to a month after your last injection was given. Many bodybuilders like to use a combination of Nolvadex & Proviron and/or HCG, while others use an anti-aromatase like Arimidex to help control estrogen related side effects. An effective dosage ranges from 500mg a week to 1000mg weekly. After a week of taking 1amp 250mgs my strenght went up and size. This stuff works and is fairly afforadable. Do not buy under ground gear it isn't worth it. I stick to orginal amps and tabs. more than 95% of under ground gear powder is from china and those *ers cut the stuff to make more money. Alot of people that I talked to say that the under ground gear they got was way under dose. 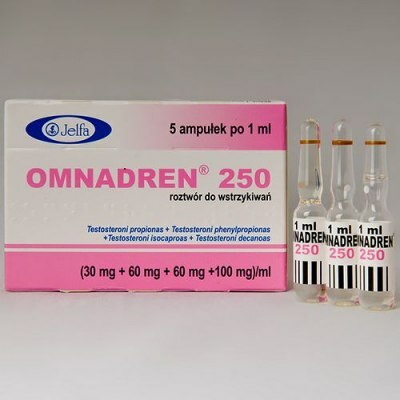 Omnadren is very good source of test for real good gains. However I would recommend 1000 mg a week or 4 amps a week. Reason why is the dosages of each test esther is low and therefore to get the maximum use and keep levels steady one must use often like prop (eod, etd). Definately need to stack with other mass builders. Also omnadren does not make high libido like other tests so one should have a viagra on hand, and use a low dosage of exemstane to keep estrogen buildup in check. I used these on my last cycle with dbol pink thais. I would have to say not the best, but it still is human grade and not bad. I think if you want to go this route you are better off with Karachi, or some Iranian Test E, if you plan on using it for the duration of the cycle.